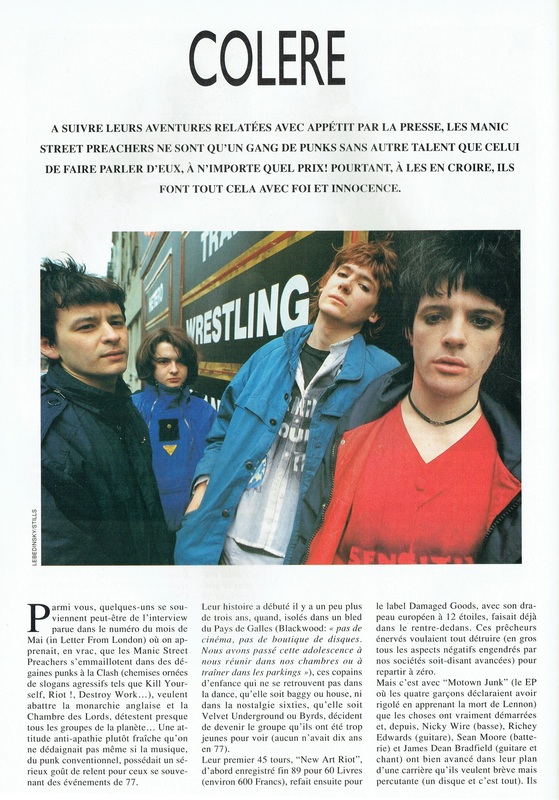 To follow their adventures recounted with appetite by the press, the Manic Street Preachers are just gang punks with no other talent than to talk about them, at any price! Nevertheless, believe them, they do it all with faith and innocence. Their story started there a little over three years ago, when isolated in a corn Wales (Blackwood. "No movies, no record store We spent that adolescence to meet us in our rooms or hanging out in parking lots "), these childhood friends who are not found in the dance, either baggy or house or in the sixties nostalgia, whether Velvet Underground or Byrds, decide to become the group they were too young to see (none had ten years in 77). Their first 45, "New Art Riot", the first recorded end 89 60 Books (600 francs), then again for the Damaged Goods label, with its European skin dra-12 star was already in le- fit inside. These angry preachers wanted to destroy everything (basically all the negative aspects generated by our societies supposedly advanced) to start from scratch. But it is with "Motown Junk" (EP where the four boys said they laughed on the death of Lennon) that things really started and since Nicky Wire (bass}, Richey Edwards (guitar), Sean Moore (drummer) and James Dean Bradfield (guitar and vocals) are well advanced in their plans for a career they want brief but incisive (a record and that's it). they signed a contract with a major label that will allow them to record the double album supposed (if all goes well) be "mega" (by sales). They began recording in England on 12 August But back behind ...On July 14, the Manic Street Preachers are in pre-production in a residential studio in Surrey and Richey lais-sé his guitar to answer some questions. You wanted to remix your double album by Hank Shocklee, producer of Public Enemy is always planned? "We do not know yet. We'll send him-chan sounds and we'll see! But we have not thought that it was some other possibilities on our list, including Consolidated San Francisco. 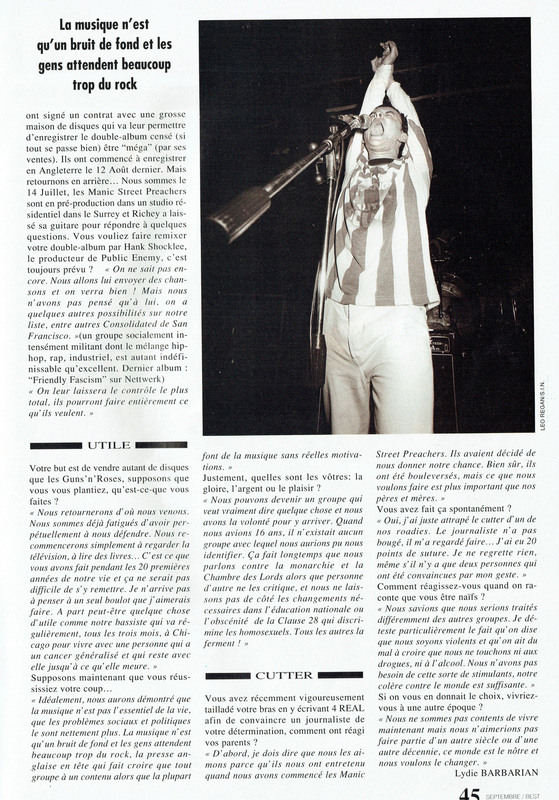 "(Socially in-tensément militant group whose hip-hop mix, rap, industrial, is much indefinable than excellent last album." Friendly Fascism "on Nettwerk) We leave them the most total control, they will be entirely what they want." Your goal is to sell as many records as Guns N 'Roses, assume you you plant, what-you doing? "We go back where we came from. We are already tired of having per-perpetually defend us. We just re-start watching television, reading books ... This is what you have done during the first 20 years of our life and it would not be difficult to put it. I can not think of a single job I want to do. Except maybe something useful as our bass player will regularly, every three months, go to Chicago to live with a person with terminal cancer and remain with her until she die." "Ideally, we have shown that music is not the essence of life, the social and political problems are much more. The music is just background noise and people expect too much of the rock, the press-year clay head that makes us believe that any group with a content while most make music without real motivations." Exactly what are yours: fame, money or pleasure? "We can become a group that really means something and we have the will to get there. When we were 16, there was no group that we could identify us. How long have we speak against the monarchy and the House of Lords as anyone else criticizes, and we do not sound lais-aside born-sary changes in national education or obscenity Clause 28 that dis-mine homosexuals. All other close!" You recently slashed your arms vigorously by writing 4 REAL to convince a reporter to your determination, how did your parents react? "First, I must say that we have-mons because they have met us when we started the Manic Street Preachers. They decided to give us a chance. Of course they were upset, but what we do is more important than our fathers and mothers." "Yes, I just grabbed the knife from one of our roadies. The journalist has not moved, he looked at me do ... I got 20 stitches. I have no regrets, even if there are only two people who have been convinced by my gesture." How do you react when you're told you're being naive? "We knew we would be treated differently from other groups. I particularly un-tested the fact that we say that we are strong and we have a hard time believing that we do not touch drugs or alcohol. So we will not need this kind of stimulants, anger against the world is enough." If you were given the choice, you would live in another era? "We are not content to live now but we would not like to belong to another century or another decade, this world is ours and we want to change it." This page was last modified on 22 March 2018, at 19:52.